This is the first darshan of the day. The name Mangla underlines auspiciousness of beginning the day with a glimpse of lord. In winter this darshan takes place before sunrise, while in summer, it is later. During Mangla darshan, the main doors of the sanctum are kept closed and are only opened after the customary initial rituals. This ensures that the drowsy divine child is not startled by large crowds rushing in to see him. It also accords with the mood of the darshan, which is bala bhava, the feelings of a parent concerned about a child's well - being another idea underlying the closed doors is that the svarupa should not be tempted to play with his young companions as opening doors might tempt him to run out! In summer, Shrinathji is clad simply in an adbandha, a light dhoti. In winter, he keeps warm with a quilted coat. His flute is not placed in his hand, for it is felt that if he were to play it early in the morning, everyone would be enchanted and all work would come to a standstill! 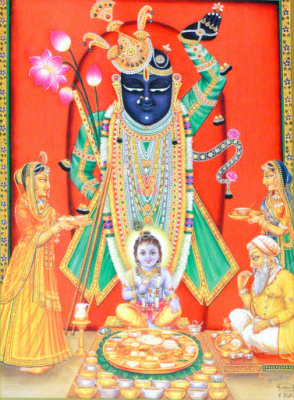 Arti is offered to Shrinathji during this darshana. This ritual banishes the evil spirits which hover around in the darkness of the night, seeking to cause harm. This morning darshana is dedicated to the memory of paramandadas, one of the asthachhapa poets. The kiratans Sung at this time are in one of the classical morning ragas - Lalita, Bhairava or Vibhasa. It is only after this meal that Shrinathji's flute is placed in his hand, so that he can delight Swamiji - Shri Radha - with the tunes she loves. The ragas sung during this darshana are Ramakali, Gunakali and Bilaval. The poet Nandadas is considered the main singer. The main meal of the day is offered to Shrinathji at Rajabhoga. 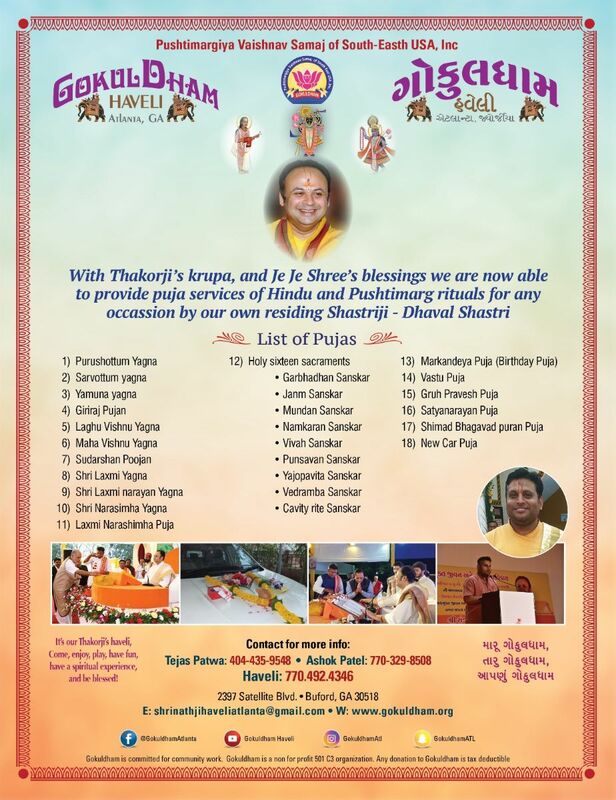 Vitthalnathji, the son of the founder of Pushti Marga, has planned this as the most elaborate darshana of all. A temple priest ascends to the terrace prior to the darshana and calls out, 'Mala Begi Laiyo!!' (bring the garland quickly). This loud call heard over a wide area, dates back to the time when Shrinathji was at Mount Govardhana. The flower garden of the temple used to be located at Chandra Sarovar, Nathdwara. 'The call for the Garland' is the signal for the darshan to be opened to the crowds waiting to catch a glimpse of the lord. The rhythmic sound of drums is heard, excitement mounts, and the doors are flung open. Shrinathji is seen in all his regal splendor, holding lotus in one hand and wearing an elaborate garland. Beeda (folded betal leaves containing spices), are placed near him, along with a pitcher of water, his beloved flute, cane to play with Genda (Ball) and a mirror. Fine perfumes are sprinkled over the kalash on the roof, and the air is redolent with its scent. At the end of this darshana the load retires for three hours. This period is known as Anavasara. Recalling his siestas with Swaminiji in meadows of Vrindavana. The chief kirtanakara of this darshana is Kumbhanadas. 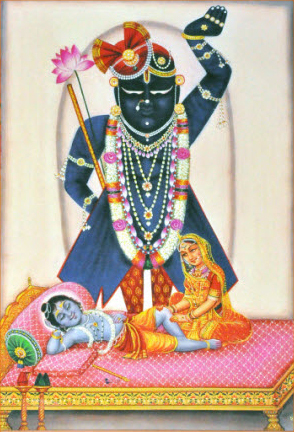 During the afternoon, around 3.30 p.m., Shrinathji is aroused from his nap. A Conch is blown, it is time for him to return home with his Cows. The vina is played followed by kirtana. Surdas, the celebrated blind devotee, mystic and poet, is supposed to be the chief singer of this darshana. GokulDham Darshana of the day commences only after rasoiya boli, when the priest ascends the terrace of the haveli and calls out - Cook, come early the following day. After this, drumming heralds Darshana. Since it is time for Lord to retire, various eatables are offered to Shrinathji. 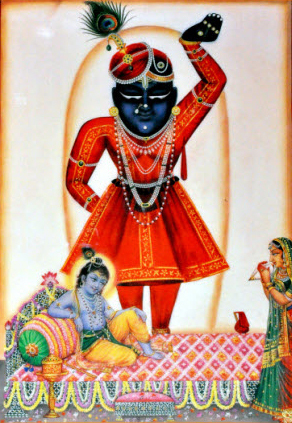 A singer praises lord in his kiratana, which may take form of an expression of a beloved's emotion and is offered to both Shrinathji and Swaminiji. Paan-Beeda (betal leaves with spices) are again offered to him. As Shrinathji is about to retire for the night, various arrangements have to be made. His bed chameber is readied for him, with a container of food, a pitcher of drinking water and Paan-Beedas. 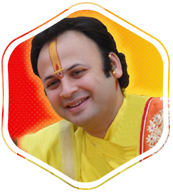 It is supposed that Shri Radha will join him during the night, her garments and jewels too are kept in readiness. 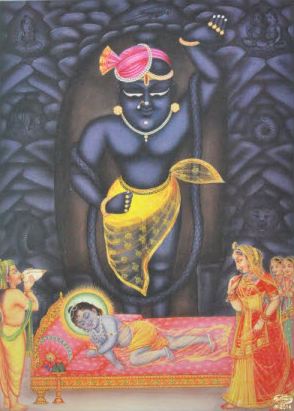 A carpet is spread on the ground leads from the image of Shrinathji to his bed chamber. It is presumed that he will walk on it in his spiritual, subtle form. The wooden platforms places in Doltibari for the devotees to stand on during darshanas are removed. This ensures that Shrinathji does not encounter any obstacles at night. To enjoy his lilas with his beloved gopis, if he desires the canopies stretched over the open courtyards to protect people from the scorching afternoon sun are also removed. 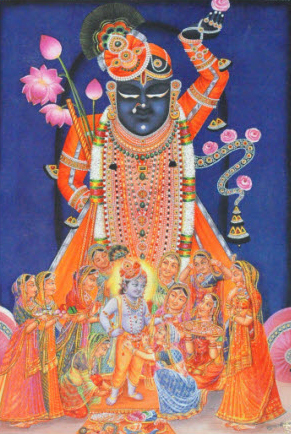 This darshana is usually not held for the six months, from Chaitra Shukla 1 to Ashvin Shukla 9, when Shrinathji is suppose to visit Vraja and reveal himself to the Vrajavasis(residents of vraja). The chief singer of this darshana is Krishanadas. Campaign Krishna 2019: Click here for the information to donate. You can be Yagna Manorathi too. 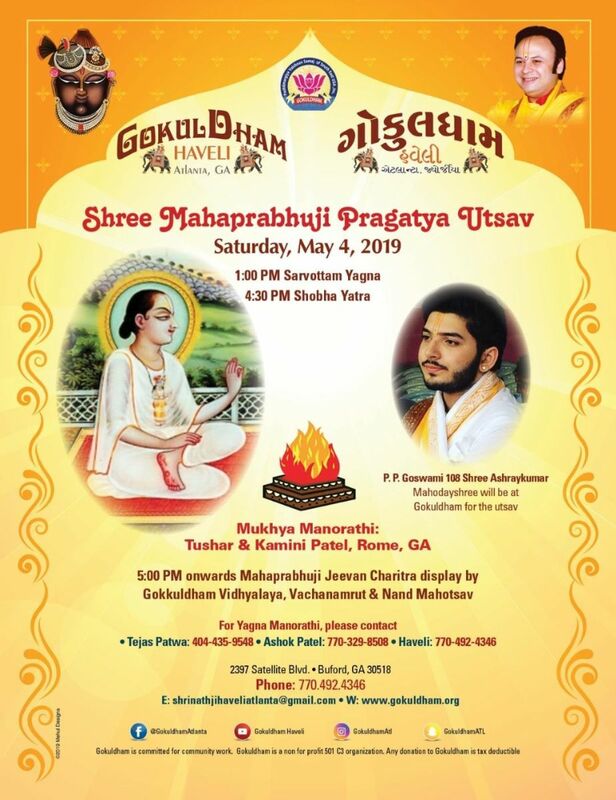 Please contact us ASAP only limited seats available for being the Yagna Manorathi.